As a mom of four, I can appreciate the art of buying food for six or more people. Skipper Mark Burton, however, takes meal planning to a different level. Mark has crossed the Atlantic Ocean eleven and a half times. An Atlantic crossing takes about three weeks – at sea – without access to a grocery store or fresh water. Mark co-skippers on a boat called Scarlet Oyster and they take 10 clients across the Atlantic at a time. Below are some of Mark’s suggestions that help to reduce garbage output at sea, while ensuring that everyone gets fed, washed, and stays hydrated. Last night, we went to Costco and inherited a mountain of cardboard. When we arrived to our boat Mark had us put all of our food on the foredeck and then we ‘stripped’ our groceries. By that, I mean we removed as much extraneous packaging as we could. Our cereal, macaroni, flour and Gatorade are now labeled and in Ziploc bags. Mark doesn’t want cardboard aboard. In a hot climate, cardboard provides a breeding ground for cockroaches. Cardboard also adds storage bulk and garbage. As we enter the Caribbean, Mark recommends that we become even more vigilant with food storage. He says that we should remove the paper labels from cans. We will then label our cans using a Sharpie pen. Mark has several reasons for cooking meat and meals in advance. First, you reduce trash. By cooking on shore you can leave your vegetable peelings behind, along with stinky meat bones. Second, it is more fuel efficient to cook multiple meals at once. Third, meal preparation allows you to attend to important things like sailing, instead of cooking over a hot stove. For planning purposes, Mark allows about 200 grams of meat per adult per day. He says that on his trips across the Atlantic he tends to plan fewer servings to start. The reason is that, initially, someone always is too sick to eat. But, in our situation, no one has been affected by seasickness. We are now using UHT and powdered milk. I made a latte this afternoon using UHT milk and it tasted slightly different. I closed my eyes and could have sworn I was in Rome. Different is fine with me. It means we are traveling. Mark says that oranges and apples will keep for 12 days out of the refrigerator. On Scarlet Oyster, Mark keeps produce in hanging baskets and turns the fruits to help them ripen and preserve their freshness. He buys half-red and half-green tomatoes, allowing them to ripen aboard. When we get to the Caribbean, Mark recommends that we hose down all of our fruits and vegetables. This is to reduce bugs and dirt. He says that the trampolines on our catamaran provide a perfect spot for washing our produce. For Scarlet Oyster, Mark doesn’t buy frozen fruit or vegetables – though I might. He tends to buy tinned produce instead. To reduce garbage, Mark washes and returns the empty tins to the cupboard. In terms of longevity, Mark says that Bimbo-brand bread is good. But, as it is full of preservatives, it sounds like genuinely nasty stuff. Carolyn Shearlock wrote an entire article about Bimbo bread on her website The Boat Galley. She says it is a bread designed for cruisers. I plan to make my own bread. However, it’s 90 degrees here in Southern Florida. With no air conditioning, I will admit my good intentions, right now, are a little half-hearted. I hope to share pictures of my first loaves on this blog in short order. In the meantime, Mark says that we can freeze store-bought bread. Or – to save space – we can freeze and eat tortilla wraps. Thanks to Costco, and Mark’s suggestion I now have 36 wraps in my possession. I have frozen my flour. I have heard that weevil eggs are unavoidable in bags of rice and flour. Freezing acts to kill the eggs so that they can’t hatch in our cupboard. Rule #6: Plan up to 5 liters of drinking water per person a day. We are just learning the ropes as to our own water consumption. Mark says that people from colder climates tend to drink a lot of water initially when faced with hotter climes. But that their water consumption declines as they become acclimatized to the heat. Mark carries emergency water aboard in canisters. He also runs the generator for two hours each day to make desalinated water using the watermaker. Mark says that water from a watermaker lacks minerals and salts. He suggested tablets from an outdoor store or Gatorade to replace these minerals. We are waiting for our water maker to be properly installed. Yet, our family has taken an early start with Gatorade – or at least the kids have – making it their beverage of choice. As for showering at sea Mark and his crew use baby wipes instead. This needs no further explanation. Mark left for the UK tonight. We will miss his guidance and patience very much. To celebrate the past couple of weeks we opened a 2002 bottle of Dom Perignon champagne. We received this bottle as a gift and it seemed the perfect time to open the bottle – following our SV Aphrodite naming ceremony. Below is a video of our daughter, Betty, as she leads the naming ceremony. Note: she is not pouring the Dom Perignon overboard. We saved the good stuff to drink. We are anchored out this evening – just our little family unit of six. Our fridge and freezer are stocked. I made three suppers to freeze tonight. 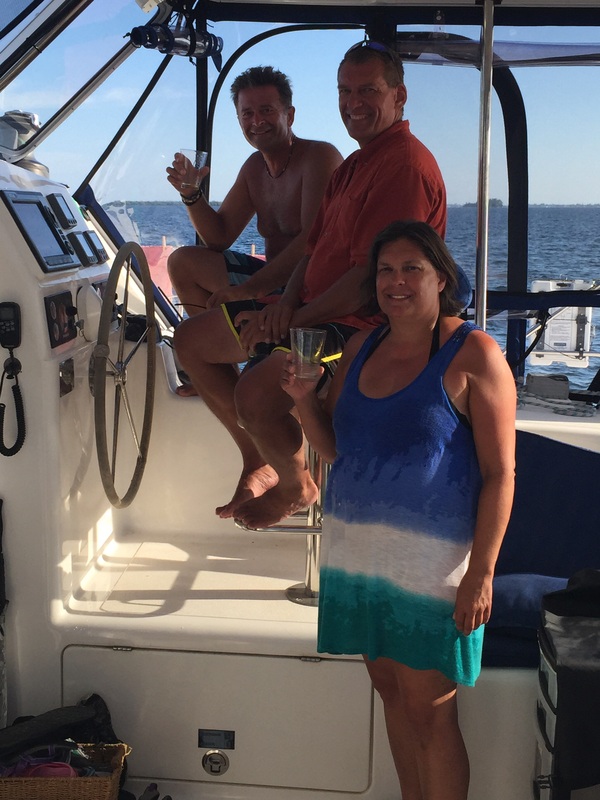 In Southern Florida (Gulf of Mexico) Mark, Rick and my sister-in-law Caroline enjoy a bottle of Dom Perignon champagne. Great suggestions! We’ve also had our challenges. Umm…crossed the Atlantic 11 1/2 times?? Yup. Mark left someone else in charge mid-crossing. She was being trained as skipper and then, mid-way they stopped at an island and she was given wings to fly. Mark flew home and met her and the rest of the crew at the other end. Bimbo bread does sound nasty, I agree. A solar oven sounds like an interesting idea, especially as I tend to bake often and use our precious propane that we really need for meals. I have been making bread onboard. It’s delicious but lacks in longevity. If we don’t eat it then it tends to dry out in just a day. Try wrapping your homemade bread first in papertowels and then in aluminum foil. It should keep until it molds. Usually it’s already gone by then and I’m sure your family of 6 would go through it faster than us.